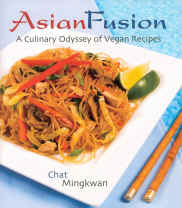 Asian Fusion is a wonderful reference and cookbook for anyone interested in Asian vegan recipes and cooking. The book begins with sections on the special Asian ingredients and special cooking equipment and utensils, and then presents country by country recipes that stretch from India to the Philippines. In Asian Fusion Chat Mingkwan has substituted plant based seasonings for the fermented fish seasonings used in many Asian recipes, so that all of the recipes are strictly vegan. One of the things we liked best about the book is learning how to achieve the authentic Asian flavors and the combination of ingredients, so that even if all the ingredients are not available in markets near us, we were able to tweak the recipes with similar available ingredients. Chat Mingkwan has traveled extensively throughout Southeast Asia, studying the unique cuisines of this region. He worked in restaurants in both France and San Francisco before starting his own company, Unusual Touch, which offers cooking classes, Asian cooking tours, and consultations.